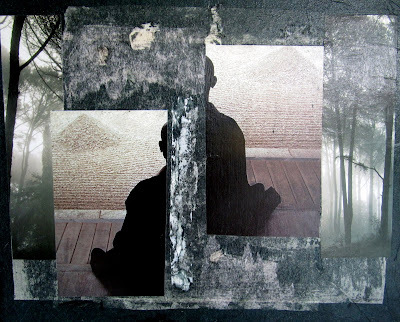 This is a collage I did from old zen/buddhist calendars. I like the silhouette effect and the misty, mysterious wooded areas in black and white. The monk appeared in the original calendar as an attached, whole being, but if you have read any of my previous posts, you know I have a propensity for cutting up images. I quite like the schizophrenic slash in this piece. I took pictures of the collage, including some closeups of sections of it. Here is one close-up with a quotation from Rumi added. Hope you enjoy the effect and the thought from Rumi. When I look at the two of them together here - I see the monk below has abandonned the duality I imposed on him above (or at least you don't see it - oops now that I'm paying attention I see he lost his head too). Come to think of it, in order to abandon duality we pretty much do have to lose our dualistic head/mind! Your beautiful collage brought back a memory: Several years ago, I entered an alterations shop and there sat sat a monk (he was from Korea, visiting his friends, the shop owners.) I was immediately...I don't know how else to describe it...washed over by an incredible calm. Some time later, I entered the same shop and there was that sudden calmness again. I asked the owner if her friend the monk had been there and she answered, "Yes." As she did not ask how I knew, I explained that I felt the calmness with which he filled the space. "Of course," she said and looked at me as if I had stated something so obvious as to make myself appear foolish. It is a beautiful collage. We say 'Health to your hands' here, after a beautiful work like this one. So health to your hands Bonnie.. I quite like Delwyn's way of thinking. I saw past and present. Where I have been and where I am now, a story of who he became one with himself and his surroundings. Sorry I have been over to visit I've been absent for a few day and now busy playing catch up. But do we really want to abandon duality? 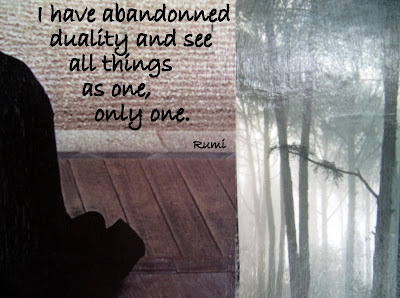 I love the collage and I love Rumi. Duality is an interesting part of life. I wonder though, can we erase it completely and what would happen if we did? It really is true, that a person who has transcended ego permeates a calm that infects us all. Thank you for the story! It's exciting to hear what people notice or take out of a piece of work. I really try not to analyze what I do while I'm doing it - so it is interesting for me to discover, with you, what has been made visible. Thanks Delwyn. What a beautiful expression: "health to your hands". Thank you so much for "bestowing" it here upon me. I will not forget that. Delwyn's comment echoes my thoughts as I studied the first piece. When we create intuitively, we speak in a language that we didn't know we knew. Isn't it amazing? Since you both ask if we would really not want duality - I will share my thoughts for both of you here. For me, "oneness" is a place I want to know how to access - whether through communion with nature or meditation . . . I agree that it is not, unless you are a monk or some such, a place where we can dwell in this world. We have lives to lead and that requires that we deal with the dual nature of life. And it requires our duality-driven ego mind to help us navigate. Duality implies to me that we are stuck in either/or thinking - and that is so limiting. That's why I think many religions are not spiritual - because for them it is usually either/or - either this or that, a dual nature. Spiritual nature slips in the gap between either/or and finds space, bliss, oneness, connectedness, moments of transcending petty ego consciousness. These moments of knowing "oneness" or non-duality are healing moments which I seek out and treasure. That's why I like images of buddhas or monks in meditative positions - to remind me of what is possible. That I can, for a moment, step out of my confused ego mind. I confess to being very influenced by Jill Bolte Taylor's book and video and her description of loosing access to the left side of her brain during a stroke and coming to inhabit the strange landscape of the eternal "now" and "oneness" of the right side. Being over invested in the left brain world, we need to experience a lot more of our right brain to really be at home here. Yes! And what is exciting, we not have to have a stroke to gain access to, or live more of our life from, our right brain. There are techniques for quieting the left-brain chatter, meditation, rhythmic movements (exercise), the arts (MUSIC), communion with nature, being some of many. Truly to live in this world we need to be whole-brain thinkers - each hemisphere has its role to play. To my mind, oneness transcends even right-brain consciousness . . . but that's a discussion for another time. I could definitely live with that collage on my wall - I love the peace and serenity of it. I love the discussions your posts inspire! Yes, isn't the creative spark amazing - and full of great surprises (I've also had a few not so great surprises, but that is part of the process!). I'm so glad you like the artwork and the discussions. That is what I truly value here - is the interaction, learning and support that is possible. Thanks so much for contributing yours. Fun collage and ever so spiritual. I’m rather a left and right brain person, and it sounds like you are too. Bonnie~ This image is stunning! I love it! I also love what you are writing and expressing. I need to come back and spend lots of time here, catching up. I love that you would choose to spend time with John O'Donohue. I would choose him as well. I have his 'Beauty' book and love each and every syllable of what we wrote and expressed. I feel so in sync with all that you write here. You are a kindred spirit, for sure! Sarah: Yes - we have two sides to our brain because we need to use them both. Key is not to get stuck in one mode and have access to only half of what you are capable of! I, too, feel we have a lot in common when I visit your blog. So glad to hear from someone who knows and appreciates John O'Donohue!!! Lovely collage. I like the stark black against the soft greys. Good job!